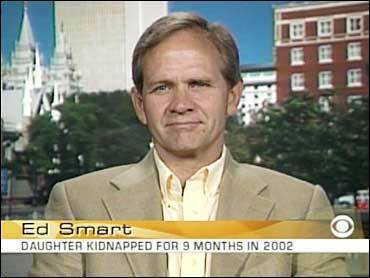 Elizabeth Smart's father says he "just doesn't see any change happening" in the mental state of the man who allegedly kidnapped his daughter Elizabeth three years ago. A judge ruled Tuesday that Brian Mitchell, 51, is mentally incompetent to stand trial. Last year, the judge ruled Mitchell's wife, Wanda Barzee, was not competent to stand trial either. Mitchell is accused of kidnapping then 14-year-old Elizabeth from her bedroom in 2002, sexually assaulting her and keeping her as his second wife until she was found nine months later. Mitchell and Barzee, 59, were charged with kidnapping, aggravated sexual assault, aggravated burglary and attempted aggravated kidnapping. He also was charged in the attempted abduction of Elizabeth's cousin. Barzee has filed for divorce. On Tuesday, the judge ordered Mitchell to a state hospital until he is able to stand trial. During the competency hearings, Mitchell shouted biblical verses and sang religious hymns. co-anchor Julie Chen he "was surprised" at the ruling. "I thought," Smart said, "he probably would be found competent because, as the judge has mentioned, she thinks he understands (what he did and what's going on), but the issue is much deeper than that, which I would agree with her on. When you think that he was willing to sever his family ties, and to just be as extreme as he has been, I just don't see any change happening." According to Utah law, Mitchell has to appear in court in three months to see if, at that point, he is competent to stand trial. "I really don't see him changing in 90 days," Smart says. "I mean, here it is three years since the time that he took her and, you know, he hasn't changed yet, so I don't really see him changing." Later, Smart said, "I think our hope at this point is that he ends up civilly committed." But, should Mitchell ever be put on trial, Smart says Elizabeth will be able to face him. "I think that she'll be able to deal with whatever it is that she has to," Smart told Chen. He added that Elizabeth is "doing so well. I really hope other children do as well as she has." Smart says the case against Mitchell has essentially been standing still: "I don't think (the case) has progressed. I mean, we're still on the competency issue at this point, and that was an issue in the very beginning. So I don't feel like we're really progressing as far as that goes."